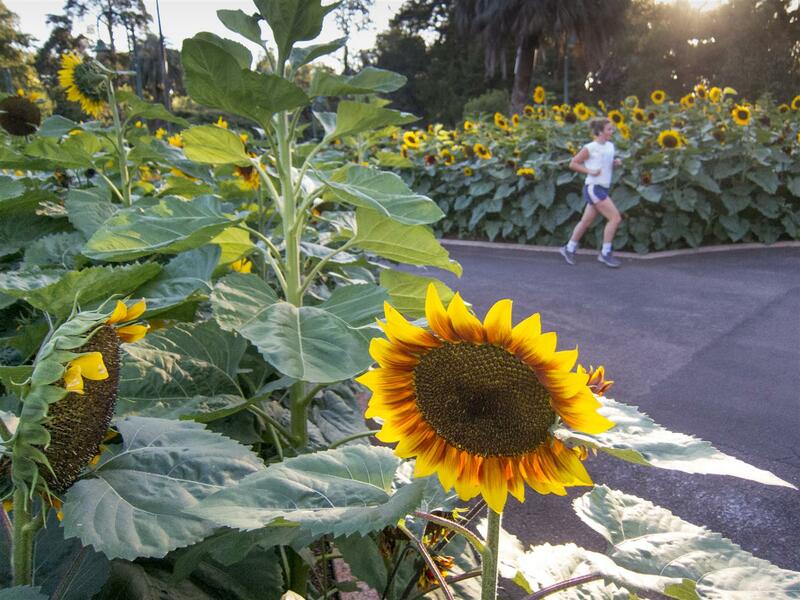 The Toowoomba Regional Council gardeners took what seemed like a radical step earlier this year when they planted a stack of sunflowers in the city’s Botanic Gardens. Being used to seeing neat and ordered rows of flowers, we became entranced by the unruly mob of stunning, large yellow flowers that grew quickly around the central statue. They were a delight to stroll past in all types of weather and fun to photograph. 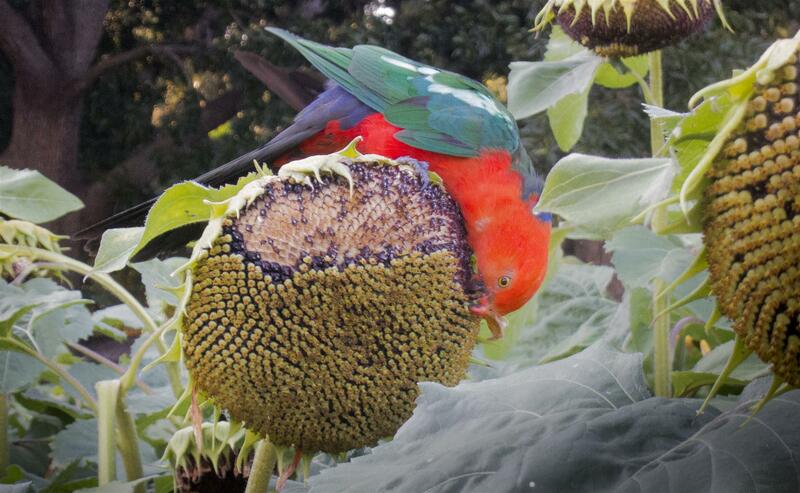 Things became even more fun though when the sunflowers developed full heads of seeds. 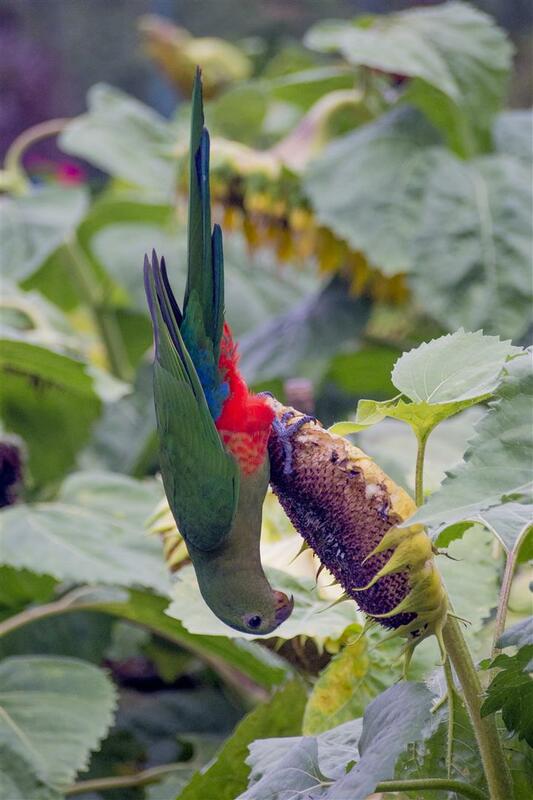 Native parrots descended in flocks to ravage the nodding flowers, creating even more mess and delightful garden chaos. 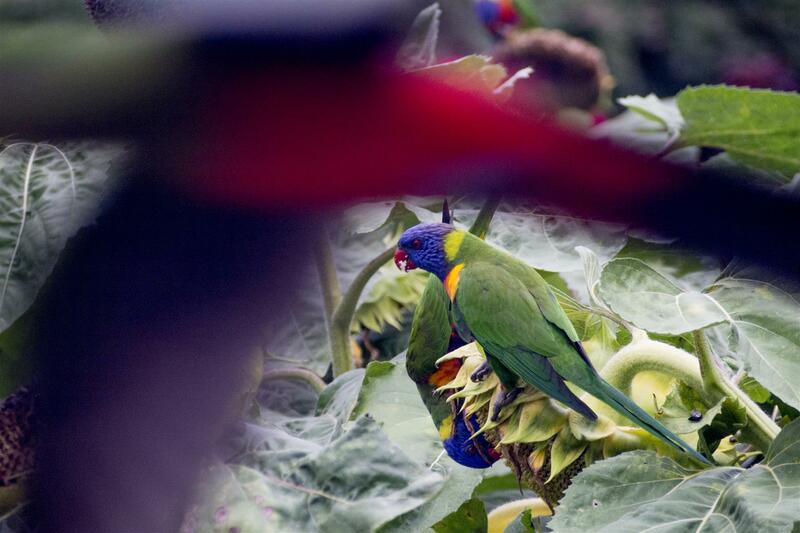 Tough, boisterous Rainbow Lorikeets and Galahs were joined by quiet and wary King Parrots and the occasional diminutive Scaly-breasted Lorikeet. All were all keen to plunder this unexpected suburban food source. 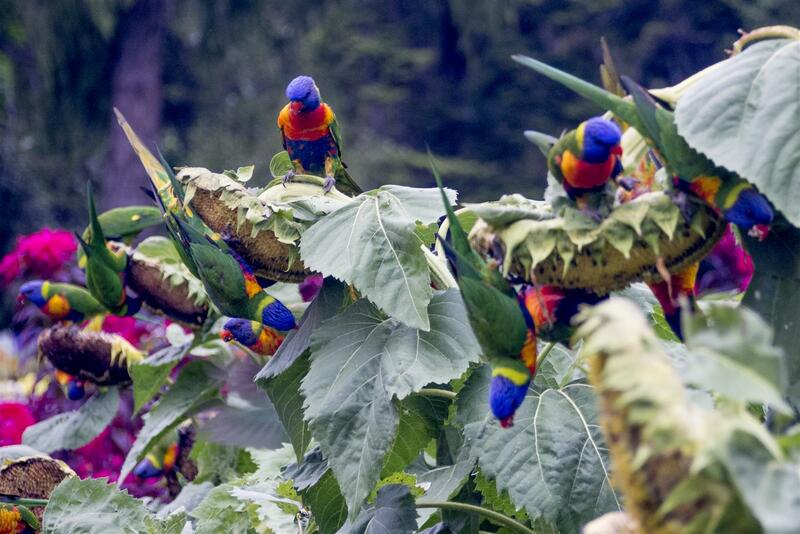 The Rainbow Lorikeets arrive — a gang of noisy, wildly-coloured avian hoodlums. Click on the images below for a closer look. I only managed a few late afternoon photo sessions, standing quietly against the flowers, before they expired and the birds moved on. Some other walkers would stop to watch the birds, but most were oblivious to the feeding frenzy going on close by. 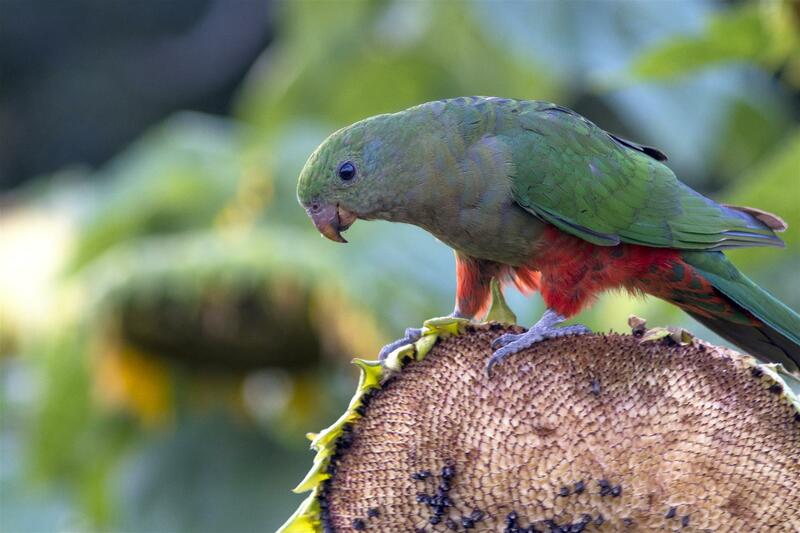 The usually wary King Parrots would freeze when people got close, their green plumage blending into the green of the sunflowers. 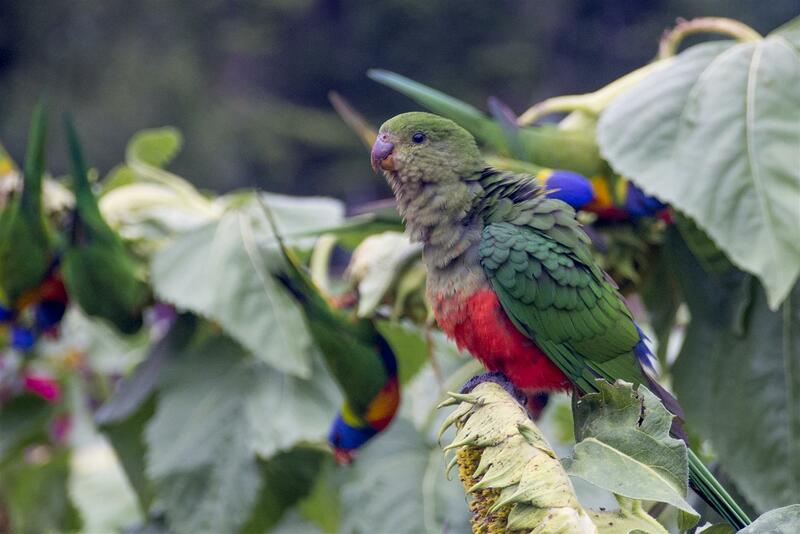 Also known as King Lories, Australian King Parrots (Alisterus scapularis) are large and quite wary parrots. They are sometimes seen flying between the town’s Camphor Laurel trees with heavy wingbeats in their laboured style of travel. However, they are swift and dexterous birds, weaving their way through the trees with surprising grace. Click on thumbnails below for closer views. A big thanks to your Botanic Gardens gardeners for brightening the place even further. Just when I think they are a bit too obsessed with neatness they plant sunflowers around the statue in the centre of the Gardens. Utterly and completely brilliant. 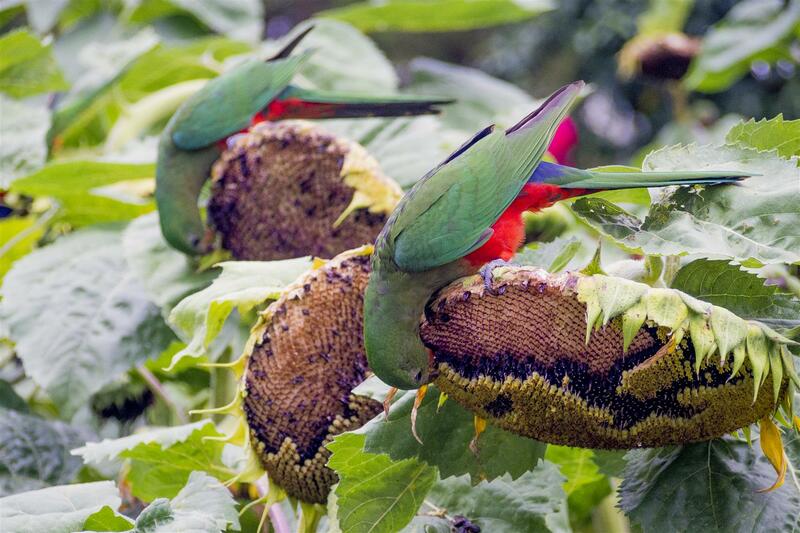 First, people marvel over the bright, unruly flowers, then to our astonishment, the seeds of the flowers provide food for at least four species of local native birds— scaly-breasted and rainbow lorikeets, galahs and the beautiful king parrots — for weeks. Last weekend people from all backgrounds were enjoying the flowers and also watching the birds. 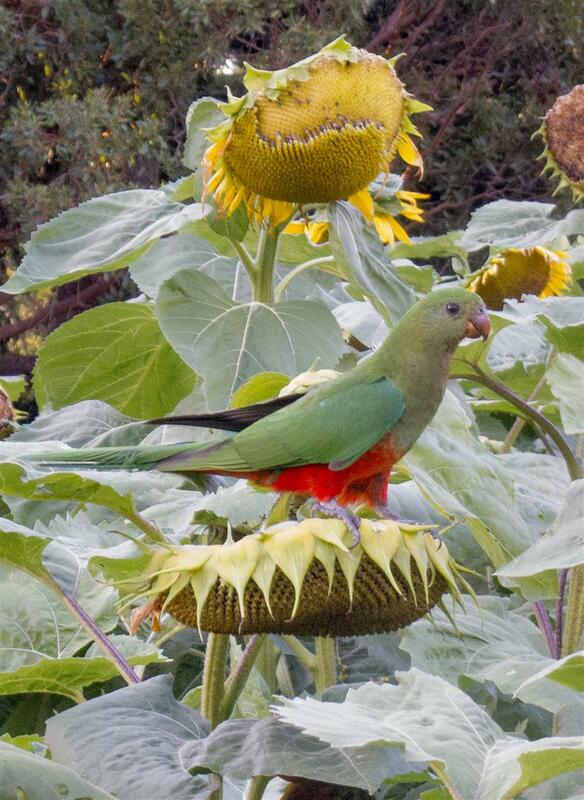 To see the huge, magnificently camouflaged (and usually very wary) king parrots quietly sitting on the sunflowers while kids on bikes raced past and walkers strolled within metres of one of our most spectacular species of parrots was most enjoyable. Bloody marvellous stuff, please pass on my sincerest thanks to the gardeners for providing this epic splash of colour and life for both people and native birds, much appreciated. Thank you so much for the wonderful photos, we were delighted to receive them and have printed copies to show all the staff. It is good to see a different theme in an area that is normally very formal and I am sure the gardeners will consider this again as it has proved to be very popular. 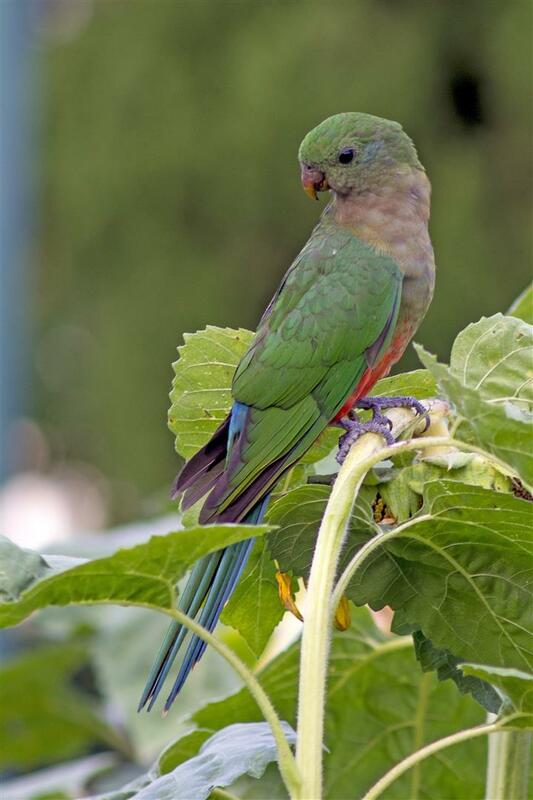 Juvenile male Australian King Parrot. This image by Harry Ashdown, all others Robert Ashdown. This entry was posted on June 27, 2014 by Robert Ashdown. Thanks Simon, great to hear from you, hope you guys are well. All the best, Rob. 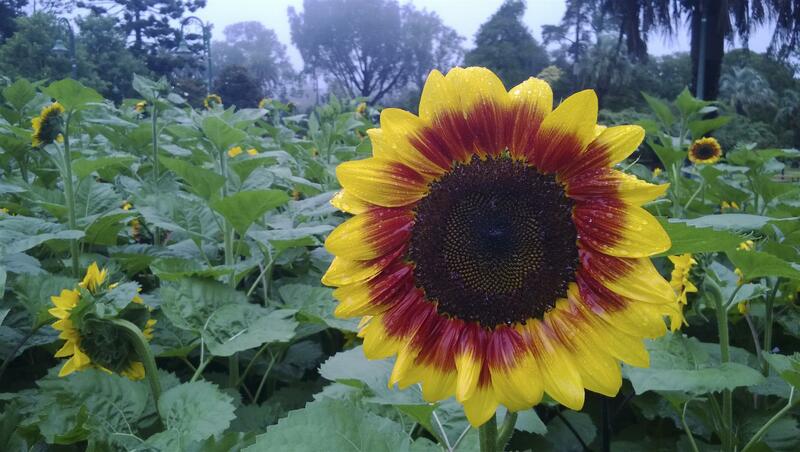 Beautiful photos of these lovely sunflowers. I wish I had seen it in person in it’s glory. 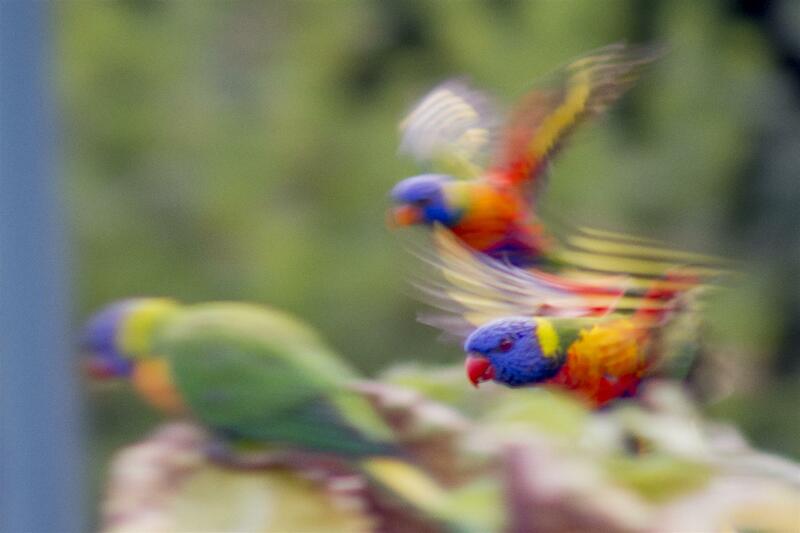 I particularly love the photo of the rainbow lorikeets in flight. Thanks, Judi. All the best, Rob. Great piece mate! Hope you are fit and well……seems like a lifetime ago that we worked together, and yes I’m still at QM churning out the pics. All the best Rob. Thanks, Gaz. Hmmm … I don’t think of you as ever ‘churning out pics” at the QM, crafting beautiful art for them is more how I’d describe it. Hey, you feature in my blog post on Girraween, not sure if you spotted it (see https://www.robertashdown.com/blog/?p=7135 Cheers, Crashdown. What a wonderful place. A lucky city. 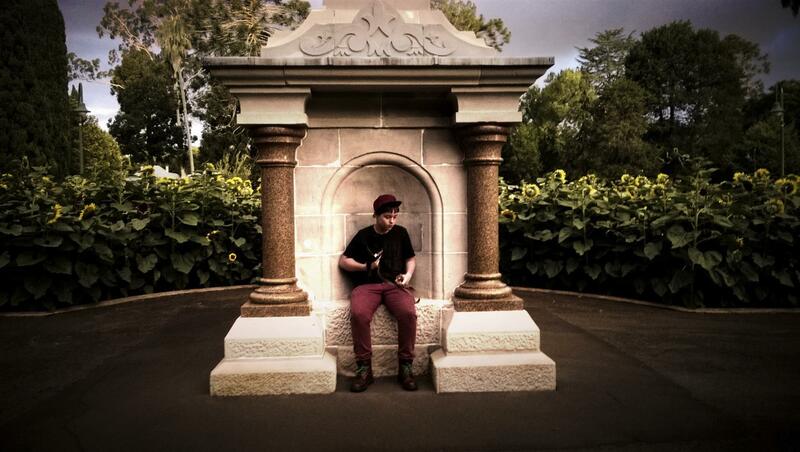 Beautifully photographed, Rob.